What the Truck?! – Page 27 – Edmonton's Food Truck Extravaganza! We’re very excited for our next big event taking place this Friday evening in Oliver along the beautiful Victoria Promenade! Below you’ll find all of the important details. Please pass this along to your friends, and we’ll see you there! The event takes place this Friday, August 3, 2012 from 5pm to 9pm. 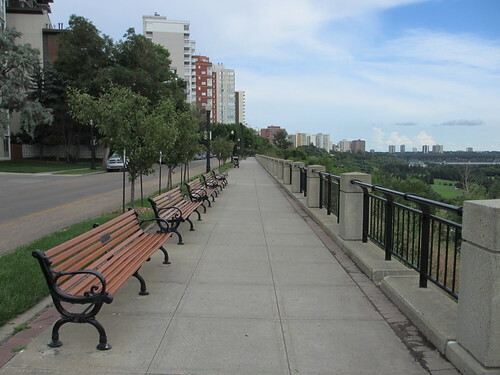 The location is Victoria Promenade, which is technically 100 Avenue. We’ll be located between 121 Street and 119 Street, which gives us a fantastic view of the river valley. There is limited street parking in the area, so plan ahead. We’re just a block south of Jasper Avenue though, so there’s lots of bus routes that go by. We’ve got full menu information online here, so you can plan what you want to try ahead of time. The lineup includes: The Act, Battista’s Calzones, Carnival Cravings, Drift, Eva Sweet, Filistix, The Lingnan, Molly’s Eats, Nomad, and Smokehouse BBQ. We couldn’t have done this event without the enthusiastic support of the Oliver Community League, so big thanks to them! They’re hosting a Community Social following What the Truck?! at the Oliver Community Hall. You can find all the details here. We’re very excited to once again have the Urban Monks DJs providing some beats for us during the event! Make sure you stop by and say hi to Thomas and Marc! At our last event in conjunction with Al Fresco, we had Tri-Line Disposal sponsor us by providing toter bins for waste. We’re very lucky to have them back as a sponsor again this time! Leaving the area as clean or cleaner than when we found it is very important to us, and it becomes a much easier job with Tri-Line’s help. Come hungry on Friday and be sure to tell your family, friends, and colleagues too! We have ten trucks this time – let’s show them how much Edmonton loves mobile food! Our Facebook event is here. We had some exciting news this week with the announcement that Eat St. is coming to town, and we’ll have some other announcements on Friday too. Don’t miss it! We’re excited to officially announce that our first What the Truck?! event of the year will take place on Saturday, June 9 from 5-11pm in conjunction with 4th Street Promenade’s annual Al Fresco block party. Best of all – the trucks will all be donating a portion of the evening’s proceeds to Zebra Child Protection Centre, Al Fresco’s charity of choice this year. Al Fresco takes place primarily on 104 Street from Jasper Avenue to 102 Avenue. What the Truck?! will be located on 104 Street just north of 102 Avenue. It’s going to be a really exciting day, with the DECL Pancake Breakfast, City Market, and Pride Parade all happening before Al Fresco and What the Truck?! get started. We are planning to post menus up on Tuesday, so check back for further details! We hope to see you on 104 Street on June 9 – please join our Facebook event and share with your friends! The weather’s warming up, and you know what that means: ‘tis the season for food trucks! We’re gearing up for our first big What the Truck?! event in June, but leading up to that, we wanted to offer some other opportunities to get your street food fix! So we are happy to announce a series of Truck Stops, our mini food truck festivals, which will take place in Old Strathcona. Every Thursday from 5-9 p.m. in May, you’ll be guaranteed great eats at McIntyre Park, where four trucks will be serving up dishes both savoury and sweet. The vendors will change from week to week, so be sure to swing by on different days to sample all of your favourite trucks. On deck this Thursday, May 3: Drift, Eva Sweet, Fat Franks and Molly’s Eats. Check back tomorrow for menu details. A special thanks to the Old Strathcona Business Association for their sponsorship of these events. Author onlyhereforthefoodPosted on December 1, 2012 Categories Uncategorized3 Comments on Announcing: Truck Stops in Old Strathcona!